Lil Smug Pug: New Polishes and Foot Cream! New Polishes and Foot Cream! I'm wearing Essie's Fair Game again today and I am really loving this color. I hold a special place in my heart for blue polishes. It's such a pretty grayish blue. It has a bit of the metallic streaks in the first coat but they usually disappear as the coat settles. 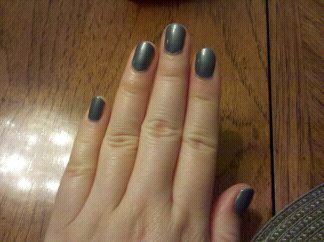 I always do at least two coats anyways and with a top coat too it ends up perfect. My evil influence is rubbing off on my mom lately. She's been trying to find a good dark green polish for a while after she realized different colored nail polishes are popular even in Korea. I asked her what colors they wear in the Korean dramas now and she replied "You know, like yours. Weird colors." Hmmm. I also picked up a couple new polishes at Target today after I was disappointed at Ulta with aggressive yet unfriendly and unhelpful salespeople and no Essie summer collection! Seriously Ulta?! 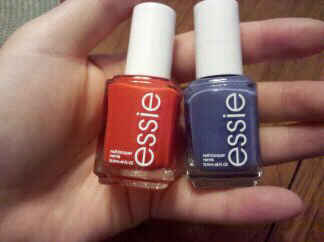 You don't have Essie's summer collection yet Target does?! For shame, you're a beauty supply store! So I picked up Meet Me at Sunset and Smooth Sailing and am really excited to try these out! Braziliant was a bit too orange for me and the other reds were a bit too pink for me. I'm hoping Meet Me at Sunset will be the Baby Bear for this Goldilocks. And Smooth Sailing looks like a sparkly lavender blue. That'll be for my nails next weekend! Oh and the Ulta trip wasn't completely useless. 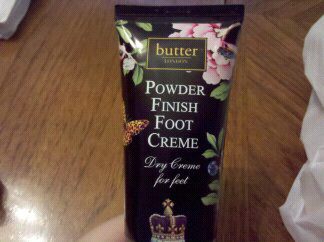 I did get Butter's Powder Finish Foot Creme. One of my friends was raving about this recently. She claims it kept her feet dry and smelling nice all day. As a regular flats wearer on the weekdays, something like this (if it works) is completely necessary and wonderful in the summer. Hope it works! I was also tempted by Butter's polishes but dang those are so much more expensive and I was good and refrained. I like to do massive amounts of internet research before I buy now (translation: I google various polish colors and ogle at the images page and then recklessly buy a ton online). Today is H-O-T yet again and now its thunderstorming. Great. Probably will just make it muggier. Bah! I think I will lay down on the floor now next to the ac vent.